Truth, ex Pegasus, ex Artforms is now available for charter for a short time between August 2012 and March 2013 in Australasia, contact Owen Clarke Design for more details. West coast sailor Philippe Kahn purchased our first Open 50 design, originally launched as Artforms in the Spring of 2006. After an extensive refit at Eric Goetz’s yard in Newport RI, Philippe raced her as Pegasus to victory in the double –handed class of that year. It was a light wind race though and the record didn’t fall. With a taller rig, new keel, a longer three metre bowsprit and again with co-skipper Richard Clarke Pegasus set of to break the record for the Pacific Cup. In fact they shattered the double handed record from San Francisco to Honolulu by over one day and a half, setting a new record for the race of 7 days, 15 hours, 17 minutes and 50 seconds. The prior record was set by Volvo Ocean Race winner Stan Honey in 1992.Crossing the finish line just before sunrise, the Pegasus Open 50 was the first to finish ahead of all 61 boats, including fully crewed racing machines that ranged from 45 feet to 73 feet in length, including TP-52s and Santa Cruz-70s. A native of Marblehead, Massachusetts, Kip Stone founded his company Artforms with the dream of building and racing an Open 50 class sailboat. Work on Kip's Open 50 Artforms began in 1999 with a four-month preliminary design and concept study that produced sufficient information to send a tender package to a series of yards, sparmakers and sailmakers worldwide. The bid was won by Sydney's famous builders, McConaghy Boats in March 2000. In any project choices are driven by different criteria, normally a combination of cost, time and experience. In this case we had all the time in the world, a good but not exhaustive budget, and an experienced sailor, but one with no previous single-handed experience. Kip wanted the best possible platform on which to sail, as he would be keeping the boat for a considerable time. The hull and basic yacht characteristics are not something that can be changed easily, whereas the rig can be upgraded over time. The choice on the rig has been to build a conservative classic carbon spar with composite stays, rigged with rod rigging V's and D's for initial longevity and cost effectiveness. This builds in security, and allows the option to later upgrade to PBO or change the rig to extend the yacht’s competitive racing life. The mast has been built by Carbontech in Australia and is a two spreader masthead configuration with a genoa, solent and staysail capable of being flown on separate stays. This fore and aft rigging is PBO and manufactured by Future Fibres. Construction began in 2002 when a build slot materialised at McConaghy Boats in Australia. The yacht was on a slow build with a team from the yard, and was worked in around the larger maxi sleds. There was ample time for Owen Clarke Design to build in features from testing and development of her larger Open 60 cousins. The result is a completeness of design and a level of detail rarely seen in open class. Alan Nebauer was hired by Owen Clarke Design to manage the build on behalf of the client. 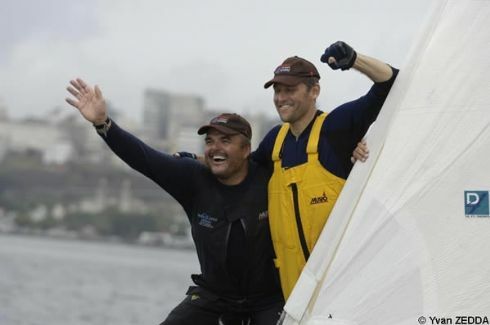 Alan, a boat builder and sailor, is better known in Australia for his participation in the 94/95 BOC race (Newcastle Australia) and his project management of the same boat in the 98/99 Around Alone (as Balance Bar) after he'd sold her to Brad Van Lieu. 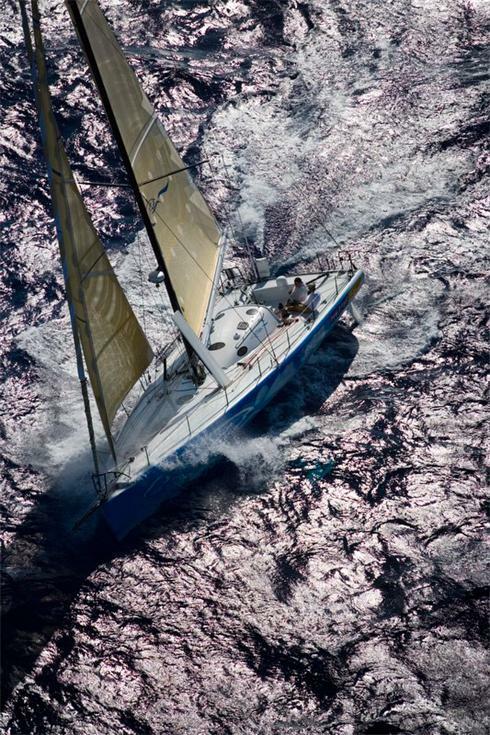 Owen Clarke Design will continue to support project management up to the start of the single-handed transatlantic race, 'The Transat', in June 2004. Passing the IMOCA 180 degree test directly after launching at McConaghys. Artforms is constructed from SP Prepreg Carbon and a Nomex honeycomb sandwich. The hull and deck were laid up in split centreline female moulds to save weight, and the utilisation of custom wood and small tooling was used throughout for the same purpose. Bow pole, rudder and dagger board stocks were built in female moulds with internal pressure bags to save weight and improve quality by enhanced fibre consolidation and void content. Devotees of the Open 60s will recognise much of that class in Artforms. She is relatively wide beamed as yachts go and her stern shape is characterised by that beam being carried almost all the way aft. From the bow there is a 6' bowsprit on which spinnakers and code sails are flown. This bowsprit is capable of being canted either side for off-wind running conditions. A canting keel that can be rotated to windward has been a standard feature on open class now for over six years and comprises a fabricated steel fin and lead bulb moved by a single hydraulic ram, with a back up safety strut to lock the keel in place in the unlikely event of a problem with the hydraulics. 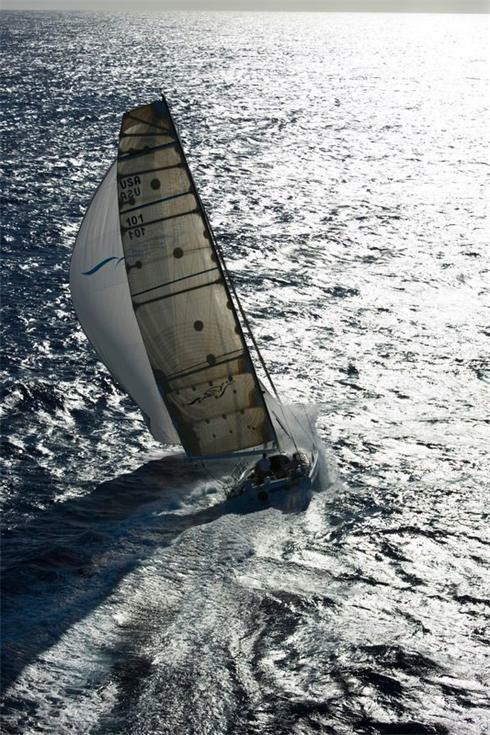 When sailing upwind the hydrodynamic side force normally created by that keel is instead developed by the lowering of one of two (port and starboard) asymmetric daggerboards. 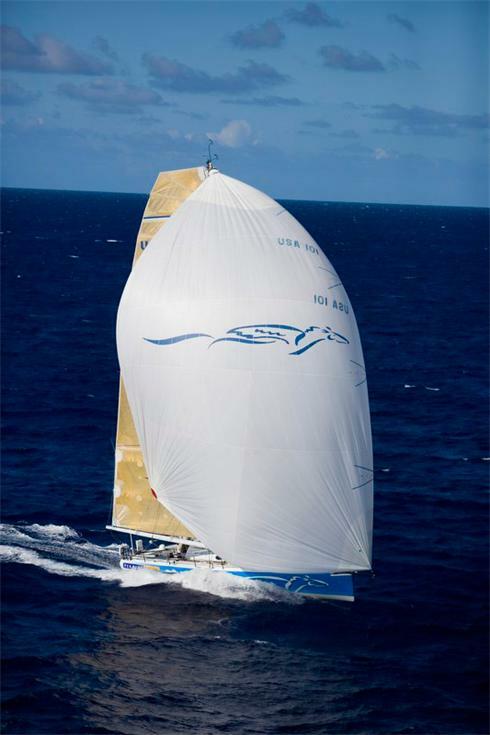 The sails were built by Quantum Sails New Zealand. The code 5, code 0, genoa and solent are all furling and the rest of the wardrobe is conventional. The mainsail is fully battened, and along with the headsail, is built using Doyle's D4 process. There is one winch on the mast for handling downwind sails, but the rest of the sail controls for reefing the main, for example, are led aft to the cockpit. The cockpit is noticeable for its trench rather than enclosed style and twin tillers. Much debate went into both choices; it was felt that at 50' tillers were a cost- effective and light solution to a yacht which would spend a great deal of time on autopilot. Artforms isn't designed just to sail single-handed however and the additional space afforded by the trench cockpit will make her easier and more pleasant to sail in the fully crewed environment. A powerful winch package specified by Harken US is aimed at making Kip's life easier during manoeuvres and reefing. All of this adds up to an exceptional single-handed racing machine, unique in her class. Down below the front of the boat is empty except for the standard forward ballast tanks just in front of the mast in the sail compartment. Moving aft, space is considerably more confined than in the 60' class with the living compartment measuring just 6'6" long by 13'wide. In this space is fitted two pipe cots, a day berth/chart table seat, chart table and simple galley with a single burner stove. The heads is the 'bucket and chuck it' variety, as you would expect. The chart area sits atop the systems compartment that contains the 27 hp main engine, hydraulic and electrical systems. The level of detailing and the standard of finish is reflected in McConaghy's reputation for producing light but stylish racing machines.